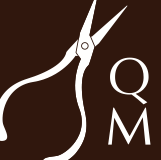 From the Quench Bench: My Website is Done! 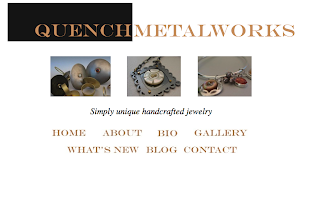 About 5 minutes ago, we (my dearest friend, Tony and I) finally finished my website, Quench Metalworks. It has been a LONG process as neither of us are web designers. However, I'm thrilled with the end product. Woo hoo for us! To celebrate, we sip white wine and will watch Larry King Live. We really should go out on the town, but, alas, this is the country and a Subway shop is "the" spot on a Monday night (or Tuesday or Wednesday...you get the idea). Yesterday, I became a memeber of the Etsy Maine Team! I am anxious to start networking with everyone involved (70+ members). I really need a mentor, for both online and offline business, so I plan to nab a willing soul, asap. I have limited business savvy and will cherish all the help that comes my way. When at Etsy, please check out our page http://www.maineteam.etsy.com/ for links to all member's shops. Truly amazing items! I spent some quiet time in the studio today doing lots of soldering. I should have new items listed on Etsy in a few days. Look for several 'jangle bangles' or 'dangle bangles' or 'charming bangles'...can you tell that I can't decide on a name...also, a brooch, a very lovely pendant with a handmade chain (this is reason for all the soldering), and a ring or two. Congratulations on the website...very nice, I checked it out. I'm new to blogging but need to figure out how to link your Etsy acct. on my blog page. I really love your jewelry and would like to have a link to Etsy. Any suggestions how I do that? For now I will put your URL for the website on my blog.